Recently I posted on how different drawings of the same underlying social network can tell very different stories. 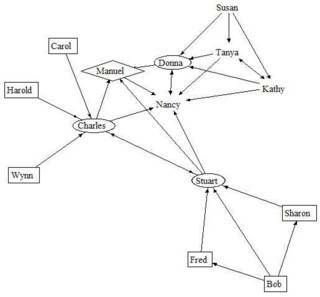 For the latest developments on visualizing social networks, see this article in the latest Journal of Social Structure written by Cathleen McGrath (College of Business Administration, Loyola Marymount University) and Jim Blythe (Information Sciences Institute, USC) -- two of the three authors I referenced in my previous post. 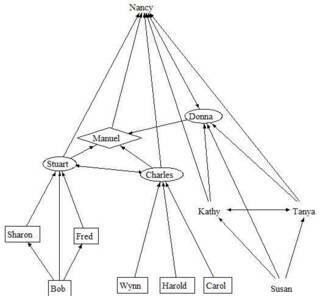 Much of the power of social networks analysis comes from the visual impact of seeing an organization drawn as a network. So understanding how observers respond to different visual cues in network layout is crucial to harnessing the power of SNA appropriately. "I think that [the first] group would definitely be more successful in implementing some changes. [This] group has many different authority figures, but there is still one central figure to oversee everything. There is an excellent flow of input in [this] group so that by the time ideas are finalized they should be perfect." "[The second] group because it did not seem as hierarchical. Also, everyone had contact with one another. It seems to me that [this] group would have an easier time because it is more informal. It was not as easy to designate a person to implement change the best for [the hierarchical] group. There needs to be more equality and evenness like [the non-hierarchical] group." Again, these two organizations are one and the same, just drawn differently. I am struck that not only does the layout heavily influence perception of the organization, but also some observers are biased to prefer formal hierarchy and others not, when asked the same question (ability to change). There's lots more in this online paper, including discussion and demonstration of how animated networks display information more powerfully than still-shots of "before" and "after" scenarios. I recommend taking a look even just to watch the animated networks and see the effect yourself.